I'm emailing you on behalf of my mother, whose deepest wish is to donate her collection of 4800 pairs of salt and pepper shakers to a museum. This collection represents a lifetime labor of time, finances and care. Each pair is unique, in excellent condition, and fascinating to view. Through the years, her collection has garnered a great deal of interest from collectors across North America. Placing her collection in a museum would also allow our extensive family, one that is now enjoying its 5th generation in the  area, a chance to continue enjoying her legacy. She was born and raised in [a small area community] and lived there for approximately 23 years before marrying my father, and has spent the last 60 years in the  area. She now lives in [a] Lodge and is dispersing her personal items and placing her house on the market. The [area] Museum Board felt it was too large of a collection for them to accommodate, therefore I'm approaching you. Would this collection be something you might be interested in? If so, I would be happy to provide further information for you. She has also offered her custom built cabinetry for donation in the event you may find it useful. If not, would you be able to direct me to an appropriate museum/facility/person? Thank you for the offer of this collection, we appreciate you thinking of the Galt Museum. 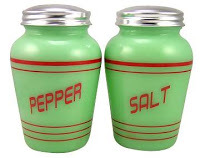 It seems your mother has put much effort and care into gathering together a wide assortment of salt & pepper shakers. The type of artifacts that the Galt Museum & Archives collects reflects a different way of looking at objects. Instead of collecting many types of the same thing, we look at gathering objects that have a strong relationship to the human history of southwestern Alberta and a unique story associated with each object. With this in mind, we do not accept collections such as your mother’s. It is rare that museums accept large individual collections, as adequate storage space and sufficient staff and other resources are often not available, and cataloguing, processing and caring for each item is extremely time consuming. If you feel there is one pair that is significant to your mother’s own story or the story of her family and their life in Alberta, the Galt may be interested in that as a donation and as a way to preserve your family’s story. What do you think should be done with private collectors item collections? Should they be sold on eBay, or perhaps to an antique store? Do community museums have an obligation to accept such collections? What do you want the Galt Museum & Archives to exhibit?